Among so many legends and stories that are part of the Galician imaginary, some may well be part of the plot of a series of fiction. Historically based or not, many of them go so deep among the neighbours that they end up being part of the identity mark of a municipality. Like Monforte de Lemos, in Lugo, which not only boasts an architectural and cultural heritage but also one of the most passionate stories of love, betrayal and revenge in the Galician popular tradition, the legend of the crown of fire. It is convenient to know the origin of the city in order to understand some parts of this story. Monforte de Lemos has its origin in the mount of San Vicente. 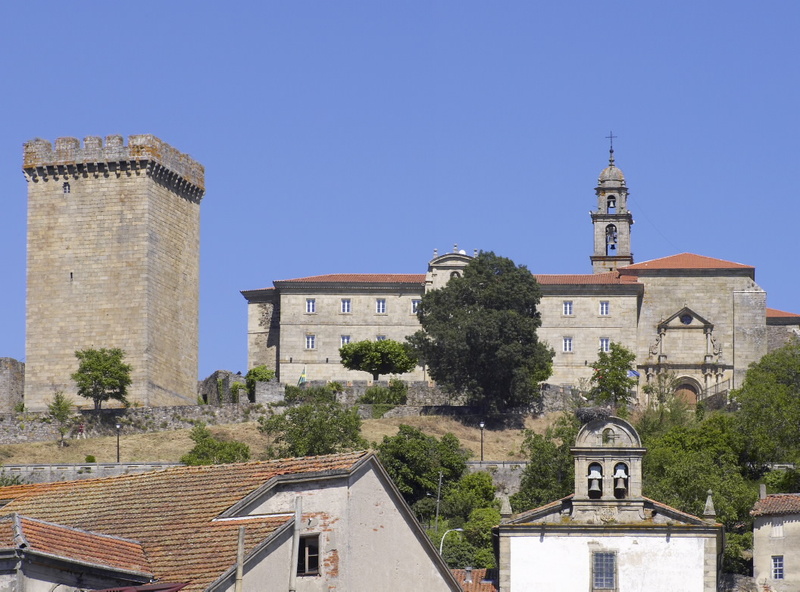 This is the site of the monumental complex of San Vicente do Pino, which houses the old Benedictine monastery, the Palacio Condal de Monforte de Lemos and the majestic Torre da Homenaxe – the main element of the fortress that has crowned the city for more than seven hundred years. In fact, this is the scenario of the legend, in which, although there are different versions, the protagonists coincide in most of the interpretations. The abbot Don Diego García III, the VII Count of Lemos and his daughter were the interpreters of this popular tale. The legend tells that the Palacio Condal de Monforte and the Monastery of San Vicente do Pino were connected by an underground passageway. This passageway was used by the clergyman during the travels of Count Pedro Fernández de Castro to enter the palace and court his beautiful daughter. The love relationship is truncated when, on returning from one of his departures from the city, the Count of Lemos discovers the betrayal. After what happened, he decides to remain calm and plan a cruel revenge. Still enraged, he quotes the abbot at a great meal and, at dessert time, he sends for a red-hot crown with which he performs the coronation, causing his immediate death. Today, the VII Count of Lemos is remembered for being one of the founders of the current city, dedicated to the government and administration of the states of Monforte, and being aware of the cultural heritage of the time. For its part, the granite tomb of abbot Don Diego García in the church of San Vicente, is directly related to the origin of the legend despite the fact that no more information about his life is known, as the monastery archives were lost in a spectacular fire. The legend is so enigmatic that several literary works have echoed this fable. One of the most recognised titles is ‘La corona de fuego o el secreto de una tumba‘ (The Crown of Fire or the Secret of a Tomb) by the writer Manuel Amor Meilán from A Coruña. A book that dates back to 1893 and that resurfaced from oblivion thanks to a new edition in 2017. The fact is that, whether the story is true or not, probably none of the protagonists would have expected such a commotion around their lives, hundreds of years after what supposedly happened.